Online registration opens Monday, Feb. 1, 2016. New event preview available now on YouTube. 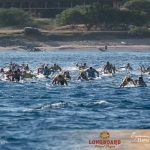 The Moloka’i-2-O’ahu Paddleboard World Championships (M2O), presented by Kona Longboard Island Lager will celebrate its 20th anniversary on Sunday, July 31, 2016. Online registration opens today, Monday, Feb. 1, 2016 at 8 a.m. PST, and closes Sunday, Feb 21. In response to high demand for race entries, a three-week registration window and lottery system will be used to allocate positions for the international field of prequalified and interested non-prequalified athletes. No entries will be accepted after Feb 21. Solo and team competitors are encouraged to review all information prior to registering. 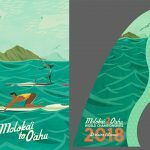 Detailed information is available now on the official event website Molokai2Oahu.com. Athletes can link directly from the site to registration. M2O celebrates the kick-off of the 2016 race announcement with the launch of the first video in a series that will lead up to race day, capturing the experience of crossing the Ka’iwi Channel. To watch the 2016 preview video and other inspiring stories from race history, visit the official M2O YouTube Channel. 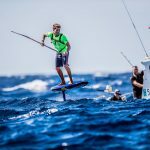 Paddleboarding fans are encouraged to get the latest M2O news through Facebook, Twitter and Google+. Race day events will be broadcast live from the Ka’iwi Channel through social media. Look for the live race results dashboard at Moloakai2Oahu.com, which will feature live athlete tracking by DotVision. M2O is an open-ocean endurance paddleboard challenge, featuring racers in both the prone and stand-up (SUP) divisions. Connecting the islands of Moloka’i and O’ahu, this 32-mile race crosses the Ka’iwi Channel, also known as the Moloka’i Channel. Men and women from more than 20 countries will face challenging conditions as they navigate the fastest downwind route over one of the deepest channels in the world. 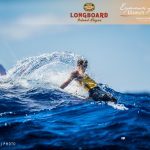 Top athletes typically complete the crossing in less than five hours, riding mid-channel waves that can crest more than 12 feet and carry paddlers hundreds of meters at a time. The race starts on Kaluakoi Beach on the north shore of Moloka’i and finishes in Maunalua Bay on the south shore of O’ahu. 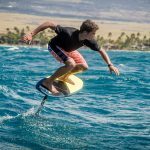 Founded in 1997, M2O has grown from a grassroots challenge for the legendary lifeguards and watermen of O’ahu to the premiere event for the sport of paddleboarding. The annual race is a deeply personal experience, challenging every paddler’s physical and mental endurance. Every finisher experiences an individual championship. Valued M2O partners include Kona Longboard Island Lager, Surftech Board Manufacturing Company, Duke’s Waikiki, Maui Jim, Garmin, Patagonia, Hawai’i Tourism Authority, Waterman’s Applied Science, Futures, Doctor Danger, Blue Rush, Bio Astin, Kona Red, SUP Think Tank, Standup Paddle Magazine, DotVision, Ocean Paddler and WND & WVS.